this is a site for showin' off my quilts, backpack shenanigans and whatever else is hammock-camping related. SUL - the consensus describes this method of backpack travel as "super ultralight" and falls into the weight category of 5 lbs of gear or less. That's right! 5 POUNDS. Frankly, it takes perfect weather and severe gear "discipline" to get outdoors safely with a backpack this light. Most of us hangers would only be able to reach this pinnacle by shaving off mere ounces by choosing minimalist gear and taking measures to go camping without usual items like a stove, by leaving the tarp and raingear behind, perhaps even all luxuries must stay home. In an odd twist, this type of hike and gear selection takes just as much preparation as something like a 4 day trip into the Wind Rivers. Less gear, one would think, takes less preparation/concentration/motivation. Not so, if you are asking. I think a pack this light takes skill, dedication, and motivation that exceeds the usual traditional pack and also the lightweight/ultralight pack. To get weights down to 15 lbs is not a difficult task, there is gear out now even in the mainstream that can do this for you, at little cost, to boot. Getting down to 10 lbs or less requires sincere observation of gear choices. You must take a leap to define what is essential and what is not. its coming across the west.. temps in Phoenix are nearly 100, and it's not even June yet! someone had asked if i had a webstore, and i realized it had not been announced here..
im pretty proud of it. Greetings fellow hangers and hammock aficionados! te-wa brings good news and cheer for all those looking for a great underquilt with the best design and lowest weight for the warmth.. well, look no further because I have come up with a new way to make your hammock camping even better! I just completed my first underquilt made with diagonal baffles. This means that as you lay diagonally in your hammock, the baffles will follow the direction of your body for the greatest amount of possible loft. As you know, flat horizontal baffles which inhibit fullest loft are a no-no and vertical baffles that run along the length of your hammock are better, these diagonal baffles are the best yet. Another first - like my end-channel bungee cords - for the demanding hanger in you. Keep in mind, that as of this writing, I am the first and only quilt maker to bring you a "diagonal" baffle pattern. Also, because some of us out there sleep "left handed" (which means your head is to the right, feet to the left) let me know if you lay this direction so i can make an UQ for your needs. Its basically the same idea, just a mirror image of a righty UQ. i had a chance to beat my old record low temp for hanging in a hammock, which was until yesterday a blistery 22 degrees... on sunday morning, we awoke to a new record low, 14.6 degrees in a hammock! my winter coat underquilt was still rockin and showed no signs of giving up. i could see this winter coat UQ easily doing 5-10 degrees without any cold spots. Good times! ive been using a new thread that ive sourced for outdoor applications: this is polyester thread that is super durable, ive tried breaking it with my hands and feel that it is much more than strong enough to last for a very long time! same size and same great features of the 3 season model, but with 5 ounces more down and 3.5" baffles overstuffed. you can expect a solid 3.5-4" loft if hung correctly. this, i expect, will take a hanger into the tens. Lets talk about the vertical baffles and the end-channel drawcords! 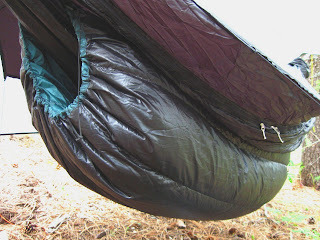 These are two functions of the te-wa Underquilt that are likely the most important feature! 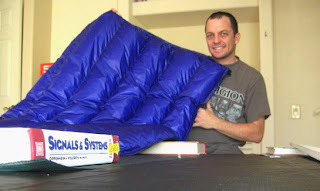 Consider for a brief moment that some underquilts, even commercially available ones, have Horizontal baffles. This means that the baffle will run side-to-side from one shoulder to the other. Whats wrong with that? you may ask... Consider now that each chamber is seperated by a no-see-um mesh baffle that is flat, and then you are trying to force that flat baffle to conform to the shape of the hammock, the user, and with weight applied. Lets look at a 48" wide quilt with 2" mesh baffles on the horizontal... There is no way physically possible to retain all of the loft that the UQ would have while laying flat IF you are trying to force a flat mesh baffle around a curve.. you end up with several problems not the least would be the mesh is going to fold, buckle, cause loss of loft and loss of warmth unless you dont get the Underquilt fully snugged up against you. 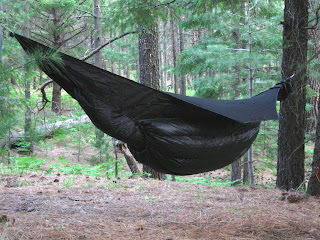 Im confidently telling you, a horizontal baffle underquilt and a curved hammock/human body is not a good combination.. in fact, i fully understand that its a poor fit! 2)stay closer to the user, preventing gaps especially when you move or roll over in the night. 3)the sliding bungee also lets the UQ follow the lay of your body which results in the only quilt that hangs on the diagonal! Less down compression, less chance of cold spots, less chance that one shoulder will be cold and the opposite thigh will be cold, the quilt will slightly shift with your body and this is a result of the clip/slider suspension system. As of this writing nobody else is doing this method, and if you see it on other commercial underquilts you can bet that they stole my idea..! The combination of size, vertical baffles, free sliding suspension, and differential baffles means that you are getting the warmest and lightest UQ that is capable of working on most any hammock. the te-wa shows off a new UQ! my quilt uses calendared 1.1 ripstop nylon with a DWR applied. The insulation is Hungarian 850+ fill power goose down. This means that one ounce of down will expand or "loft" to over 850 cubic inches of airspace. The baffles are made of No-see-um mesh, and the thread is Gutterman polyester for strengh and long life in outdoor situations. All materials are first quality. 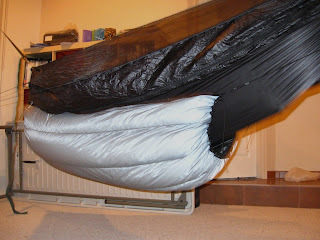 how to hang the te-wa underquilt: attach the clips on the hammock ends, and snug up the drawcords. it becomes second nature very quickly. in this case, Less Is More and the UQ is simply a no-fuss item that is easy to use. the color pattern is black outside with silver inside, but this one i reversed just for fun. you'll never know such sleeping comfort in the backcountry as a hammock and underquilt. this is where its at, backpackers, this is the future! quilt measures 40wide by 52long and has 7 ounces of Hungarian 850 fill power goose down. pic shows the te-wa UQ on a warbonnet blackbird hammock. 13oz goose down underquilt good to 25°, fits any end-gathered hammock complete with hanging kit and stuff sack. This UQ fits from head to knee, and you'll use a ccf pad for your lower legs (which require much less insulation). mikeinfhaz@yahoo.com if you have comments or praises. 1999- started with a 40 lb base weight backpack 2001- whittled my gear selection and improved my outlook by choosing lighter gear 2003- officially entered the Ultralight Backpacking movement with a base weight of under 10 lbs 2006- started making my own gear, including high quality goose down quilts 2008- became a full time hammock user. tried it once, hooked instantly. will never go back to sleeping on the ground. ever! 2009- continue to provide excellent Gear to the hammock hanger, ultralight enthusiast, and serious backpacker. 2010 to Present: made several successful trips at SUL weights, (sub 5 lb base) with a hammock, proving that hammocking and ultralight can be combined. do it!